I have turned my attention to important things. Like keeping my New Years' resolution. As promised, I have started trawling the blogosphere for easy Indian recipes to try out and then write about. My first port of call was Asha, who writes about food and life. She has been married for more than 20 years and you can almost picture her smiling when you read her blogs. A winner if I can spot one. The recipe that inspired me was a North Indian Dal Palak, lentils nestled in spinach spiked with dark warming spices, tomato and onion. The interesting thing here is that while most dhals are soupy in texture (some thicker than others), this dish is more like a vegetable side. It would be just as lovely with thick bread and rotis, as it would with some rice and yoghurt. I made some small adjustments to Asha's recipe to make it quicker. I used ready frozen chopped spinach because I always have some in the freezer and it can be a healthier option. I also didn't use mustard seeds and curry leaves in the tempering or tarka because I didn't think the dish needed it and because these ingredients aren't commonly used in North Indian cooking. Once I'd cooked it, I was bowled over. This recipe should have come with a warning for over eating! Especially in this cold weather. First wash the lentils thoroughly and leave them in the sieve. Next, heat the sunflower oil on high. When it’s hot, toss in the cumin seeds and chilli, and as they sizzle up add the onions, ginger and garlic, dry spices (bar the garam masala) and tomato. Saute the mixture or masala for 10 minutes until their pungent raw aroma softens. You can add a bit of hot water and scrape well if the ingredients start sticking to the bottom of the pan. Next add the lentils and c over with hot water and boil until cooked but not mushy. The lentils should squish easily in your fingers but not lose shape. This will take about 15 minutes. Now, tip in the spinach and stir through. Add salt, the garam masala and stir through to finish the Dal Palak. Voila! Since the lentil iron chef battle I’ve been itching to make something with lentils. This might just be it if I have time this week! This looks great……I usually leave out the onions and add garlic – LOTS of it….This goes perfect with some tandoori rotis..
hey–happy new year!! Are you by any chance in cal? and do you have a contact for alka? in town and wanted to catch up. BTW am totally going to try this recipe the moment i head back to singlehood in delhi!! 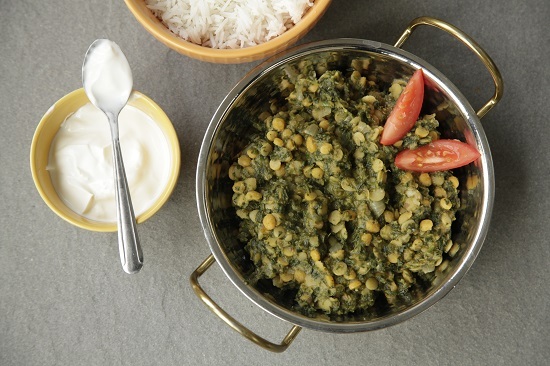 You know what I had seen Sanjeev Kapoor prepare Dal Palak once with Musuri’r Dal (which I think is a Bong favorite) and since then I try to make Musuri’r Dal with all sorts of green leafy things. I also go low on the ginger and the masala, the dal as a result is good for everyday food but not much of a party dish. It’s a substantial comfort food,great for winter.Enjoy! toor=sambhar daal, big and yellow. i vote daal post on the basics section!! yum. these sound amazing. am really glad you’re keeping your resolution. what are toor lentils? Is it toor dal or black or red lentils? Hi Smita, toor dal is split pigeon peas, it’s sort of deep yellow in colour.